To keep your Hamilton Beach air purifiers operating and in their best shape, you should replace the filters and bulbs regularly. Our selection of top-notch Hamilton Beach Air Cleaner Filters includes filters for a wide range of Hamilton Beach models to keep your living space free of airborne contaminants, bacteria, mold and viruses. 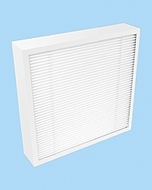 We offer Hamilton Beach replacement allergen reducer modular filters, air-purifier carbon pre-filters, smoke odor filters and pet odor filters to safeguard your home against allergy triggers and less-than-savory household odors. Our Hamilton Beach filter replacements suit a wide range of popular Hamilton Beach models. We carry filter replacements for Hamilton Beach models 04372, 04382, 04392, 04381, 04160, 04161 and more to ensure that you get the proper filter for your unique filter system. We also carry Hamilton Beach All-Purpose Replacement Air Cleaner Filters and replacement germicidal bulbs for your plug-in wall mounts to ensure that your favorite plug-in filters remain fully functional for years to come.